With a background of over 35 years in the field of furniture crafts and conservation, owner Tim McCall-Judson has accumulated a broad knowledge of treatments on English, European and American period furniture and objects. In addition to structural restoration, our company also offers treatments to veneer and marquetry work, inlaid materials, decorative gold leaf and painted surfaces. We also restore gilt frames for paintings, mirrors and the like. 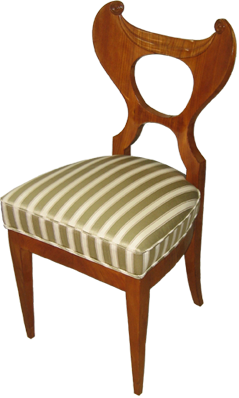 We also can provide upholstery services as well as caning and rush seat replacements. We strive to retain or replicate where necessary the period woodworking methods and techniques associated with hand made antique furniture. Old or original surface finishes should be preserved wherever possible but, in the event of substantial damage or loss, we also offer a range of period finishing techniques including French polishing, varnishing, oil and wax finishing together with the use of stable colorants to visually blend surfaces. In addition to period finishing methods, we can also provide lacquer based finishes for those who prefer a more modern finish coating. We are also conversant with modern minimally invasive methods and materials used to clean and preserve existing old surfaces. Often older antique pieces have been refinished with modern coatings such as spray cellulose lacquers, varnishes or polyurethanes. Wholesale replacement of these inappropriate finishes is certainly viable. It is worth noting that period finish materials like shellac offer excellent durability, a superior appearance, greater repair-ability over modern finishes. Shellac gives a much more organic look (it is an organic resin) when compared to modern finishes, is more adaptable and readily repairable should minor damage occur. Copyright © 2017 McCall Restoration Services.